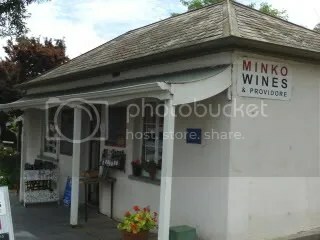 Nestled into the main street of Willunga is a little gem that is Minko wines. This old world building is the working home of Margo who was just voted the 2010 Outstanding Cellar Door Person Award – well done Margo. 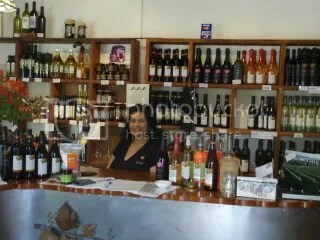 You can also get a number of fine foods, coffee, olive oils and a couple of times a week wonderful fresh bread. The wines are made from grapes sourced from the company vineyards in Mount Compass which is outside the McLaren Vale region but they get a mention here because because of the cellar door location. I was impressed to see a Vinturi being used to serve the wines. The Vinturi is a wine aerator that provides the wine with air integration like they have been open for a considerable time. They also offer a wine flight with 3 Pinot Noirs complete with tasting notes and a tasting platter of Pate, Cheeses, smoked semi dried tomatoes and crackers all served in the side garden setting. All for the low sum of $10 per person and then you have the option to buy 2 of each Pinot in a 6 pack for $135 compared to $150 normally. An interesting aroma of Lychees and honey mead. The flavours start with stone fruits and green apple and leaves you with a lychee finish. The wine is neither sweet or dry and thus can be drunk in many settings with and without food. How about a French Onion Tart. The aromas were a little closed but there was a hint of stone fruit. The flavours are dominated by the stone fruits of nectarines. There is a softness here with just a little sweetness. I can see a wild rocket, cherry tomato and red onion salad with a pan fried salmon fillet. Lots and lots of rockmelon aromas that continued in the flavour profile. There is alot of acid here that leads to citrus note across the whole palate and then leaves a fresh grapefruit finish. I found this a very different wine that sparked my interest – this does not happen often with unwooded chardonnay. The acids scream seafood – so with a twist lets try it with crab stuffed into chicken breast fillets. Starting with orange peel aromas, I was concerned that this was going to be a very sweet wine and was concerned that my palate was going to explode with sugar and then I was going to struggle with the red wines to come. Well I should not have been concerned as the wine was not cloying at all – the acids here were enough to clear the palate of the sugars. Flavours of orange and apricots leads one to think about Mum’s Apricot Crumble. Quite aromatic with violets and sour cherries with a savory finish. Flaours just remind me of a fresh berry compote with just a little sour cherry thrown in. As expected this is a lighter style wine which made me think of a match with runny soft goats cheese with fresh crusty french stick. The aromas just leapt of of the glass well before I got the glass anywhere near my nose – just like I was crushing fresh cherries and raspberries with some savory oak notes on the finish. Like the aromas I also got an immediate understanding of complexity here. Cherries mixed up with some small amounts of mushroom compost and then wrappd up in a spiced beetroot envelope. I do not normally drink Pinot Noir but I bought some of this to take home with me and I am thinking one of my home made pizzas with lots of mushrooms, smoked mussels, sausage with chunks of Fetta. Not normally for tasting – this wine is part of the Pinot Noir Wine Flight as already outlined. This wine to me shows why Piont Noir can be such a fickle variety as it showed some savory cherries but none of the complexity and fruit power of the previous 2 wines. Interestingly this wine started as the usual Cabernet and I though – well here we go again just another Cabernet. By the time I was finished I realised I was so wrong. On top of the blackcurrents one expects from the variety I got the eucalyptus and menthol that I really get these days. These note leads me to straight away think of roast lamb with mint sauce to go with the wine. Different again – this time I get a real meaty aroma to go with blackcurrent and the cigar box from oak treatments. The flavours are full of berries with a dusty tannin finish. The fruit here makes me think of herb crusted lamb loin chops. Lots of sweet fruits (but not too sweet) with blackcurrents dominating. The tannins are light and the finish is refreshing. There is enough complexity here to say this is a serious wine made for fun. Can be drunk at any time with almost anything – not just the Xmas turkey smothered in cranberry sauce. This entry was posted in Mclaren Vale, wine and tagged Australia, Cabernet Sauvignon, cellar door, Chardonnay, Food, Mclaren Vale, Pinot gris, Pinot noir, sparkling wine, wine, wine McLaren Vale, Wine tasting descriptors. Bookmark the permalink.